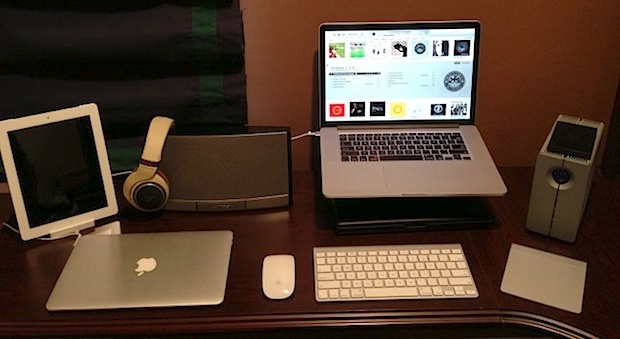 This weeks Mac setup comes to us from Dean K., a musician who uses his Mac setup for listening to music and editing. Finding the black MacBook is a bit like playing Where’s Waldo, it’s barely visible under the MacBook Pro stand. The photo was taken with an iPhone 5 32GB. He could have done this all with Windows PC’s for 1/10th the cost of all that crap. Why buy a ford when you can afford a ferrari..? Yes. For musician nothing’s better than Mac. What are you doing here. Go back to your cave with your Windows crap. BTW, I think William needs some glasses. That black MacBook isn’t hard to find at all. Musicians who don’t use speakers are no musicians. You should check out my Boston Acoustics surround sound system at home… can’t bring that one to college. You may want revise that statement..
Got those same headphones. Love them! This is complete and utter nonsense. There are no speakers and no instruments not even so much as a midi controller, this is not much more than a collection of laptops surely?! Yeah, but you’ve got to admit they’re nice laptops. Uh, I would consider myself a musician, and I also have a laptop and headphones. Why is everyone freaking out? Take a chill peeps. Yeah. Making music without even monitors must be hard. But he sure knows to crank that J Bieber up on his Bose SoundDock. Looky- Pathetic? Strong words for no apparent reason. Just appreciate the set-up for what it is at face value. There’s no need to have a go. Secondly I never understood this whole idea of hating on someone because their parents have purchased expensive things for their children. I see so much of it on the net and it’s just sad. You don’t know for sure that it was bought by his parents and even if it was, why does it matter to you so much that you have to bring such negativity to the post. Sounds like personal issues misdirected. Simply put, grow up and pipe down. Dean- nice set-up.. Looks good.